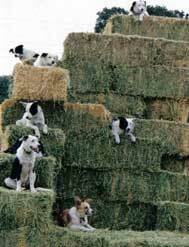 The Goats R Us herders utilize the intelligent, hard working Border Collie for managing one to one thousand goats. 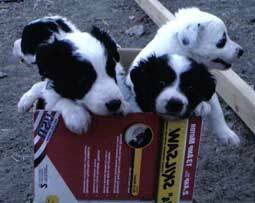 Border Collies are famous for their ability to work with livestock. They have what is known as the “eye,” which translates into a single-minded focus on one thing: a trainer, a goat, or, in the case of our retired dogs, the house cats. It is this focus that makes them such excellent working dogs. All of our Border Collies are bred, raised and trained by Goats R Us staff. The dogs are trained to respond to calls, whistles, and hand signals, and each man and dog team develop their own particular language for communicating. Each pair enjoys a special bond that enables them to effectively move goats through a wide grassland or the busy, narrow streets of San Francisco.